GGU Law Students Make Strong Showing at Annual Lefkowitz Moot Court Competition | Owen, Wickersham & Erickson, P.C. 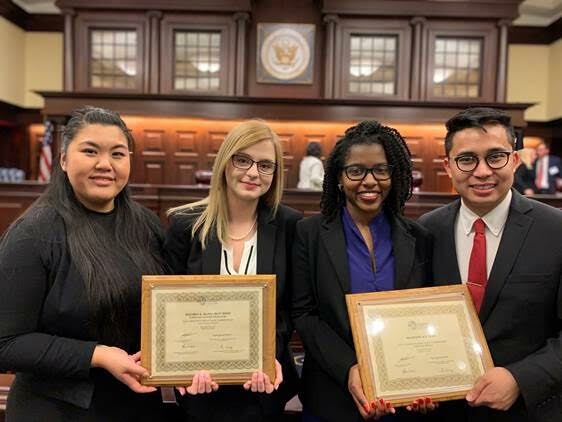 Kudos to the four-student team from Golden Gate University (GGU) School of Law which made a strong showing at the 28th annual Saul Lefkowitz Moot Court Competition held in Washington D.C. on March 16, 2019, finishing second overall and winning the award for best brief. OWE’s Larry Townsend provided coaching assistance to the team – composed of Amy Saechao, Kate Christensen, Kyndal Curie, and Gianne Carlo Nalangan – in preparation for the finals. OWE is a longtime supporter of GGU’s Center for Intellectual Property and Privacy Law with Larry and John C. Baum currently serving on its Advisory Board. Greg Owen and Kathy Letourneau, a GGU Law alum, previously served as Advisory Board members. John, past national chair of INTA’s Lefkowitz Committee, was a judge for the San Francisco regional competition held on February 9 and, as a current Lefkowitz Committee member, participated at the national finals in Washington D.C. held at the Court of Appeals for the Federal Circuit. The finals were judged by panels made up of 22 members of the Trademark Trial and Appeals Board of the U.S. Patent and Trademark Office, including Chief Judge Gerard Rogers. The Lefkowitz Competition is a prestigious, nationally-recognized annual trademark law event, with law school teams throughout the country participating in a series of regional competitions leading to a national final. Hundreds of trademark lawyers and other professionals from top trademark firms, in-house legal departments, and the USPTO around the country volunteer each year to research and write the competition materials, judge student briefs and oral arguments, and assist with the regional and national competitions. Hosted by INTA, the International Trademark Association, the competition introduces law students to important issues arising in U.S. trademark and unfair competition law. Students develop their brief writing and oral advocacy skills in a mock courtroom experience.